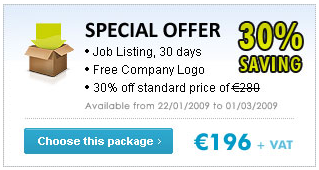 To have a good niche job site in Ireland you need a good domain name. Most are gone, simply since Jobs.ie, or Saon group bought them. Here is just a list of some of the domains pointing to the jobs from Jobs.ie – some redirected domains, some showing some niche jobs sites. So, not that many domains available any more for a niche jobs sites. Jobs.ie really got a long list of good ones. Sorry you are too late! Or are there some hidden gems out there? Jobs.ie Career Workshop – €100 only! I got a mail this morning from Jobs.ie web site. They are offering me a 100€ career workshop. I thought about it during a coffee this morning. Recruit Ireland have changed their model and are offering free advertisements to the Irish employers. Until they fill their books with names, whom to start selling once when the recession is gone. Their prediction is in September. That being September 2009. In the same time Jobs web site is looking for other sources of revenue. And there are the job seekers. With thousands of job seekers on your site daily, why not offer them something, for let’s say,… 100 quid? There certainly is a market for it since we are in the steady double digit unemployment with very little signs of it getting any better anytime soon. With so many people hungry for jobs – why not take a €100 of each? In a form of coaching? I have to admit, I like the recruit Ireland approach better with their Get Ireland Working campaign. What Jobs site is doing kind of sounds like: Get Ireland Paying. I know, I know. Recruit Ireland is after the same money. They will start charging those employers the moment they can. I just like the Employers paying for the recruitment advertising, not job seekers. I do not think it’s really fair to ask someone looking for a job, especially if unemployed – anything! Not even shaped in the fancy candy bar wrapping of ‘ Career Coaching’. And no, I am not a socialist. Subject: Jobs.ie Career Workshop – Thursday August 13th. CAREER WORKSHOP – BEAT THE MARKET & INVEST IN YOUR CAREER. The Job Market in Ireland has changed dramatically. There are less jobs and increased competition for them. Developing your career including finding the role you want now requires a more dynamic approach to find success. Jane Downes of Clearview Coaching Group in conjunction with Jobs.ie is delighted to announce, due to consistently strong feedback from previous attendees, that the next “Career Workshop” tailor made for this market will take place Thursday August 13th in the Davenport Hotel Dublin 2 at 6pm. Having completed research into the needs of the sites users, numerous requests were made to create a workshop for job seekers. The good news is that we have now done so and it is to be run by one of Irelands leading on the ground Career Coaching Experts, Jane Downes. This workshop is suitable for individuals of all levels seeking work, making total career changes or those who need to take stock and effectively plan their next move. It is also an option for an organisation seeking to offer redundancy support to employees. An inventory of your own individual transferable skills. An assessment of your own unique personality profile. Learn the 8 key things needed and which will determine and affect your success in career change. CV’s & Cover letters – How to market yourself and give an impressive consistent message. Essential Interviewing skills – How to sell yourself and get more job offers. Job Search Strategies and Planning – get ahead of the rest! Clarity about where to go next including an assessment of your personality profile. Renewed confidence about what you have to offer and how to manage your career. A clear consistent message to offer potential employers. A polished and dusted off YOU ready to face the market and “go public”. A workable plan to get you to where you want to be. Jane Downes is founder of Clearview Coaching Group (www.clearviewcoachgroup.com) which was established in 2004 following an extensive career working within the area of Executive Search, Recruitment and HR Consulting. Assignments frequently involved carrying out recruitment consulting projects for some of Ireland’s brand name clients. Jane uses this vital experience gained in her Executive and Career coaching sessions with her clients and in her workshops. Jane also co owns Irelands 1st Assessment and Coaching Centre for Emotional Intelligence – www.EIIreland.com. Jane regularly writes for the National Press on Career, Motivation & planning and managing yourself within the workplace. Jane is a qualified Life & Business Coach, Career Coach Assessor and licensed Emotional Intellegence Assessor (EQi). She also has a 1st class honours Social Science Degree from UCD and a 1st Class honours Training qualification (NUI). If you do not wish to receive mailings from Jobs.ie click here to unsubscribe. Posted on July 31, 2009 July 31, 2009 Categories Blogs, Career, CV, Internet, Job Site, Jobs, RecruitmentTags Candy Bar, career coaching, Career Job, Career Workshop, Conjunction, Double Digit Unemployment, Dynamic Approach, Free Advertisements, Info Jobs, Irish Employers, Irish Jobs, IrishJobs, job seekers, Jobs Career, Jobs.ie, recession, recruit ireland, Recruitment Advertising, Time Jobs1 Comment on Jobs.ie Career Workshop – €100 only! Jobs.ie has a new logo. Actually it is still the same as it was since about 4 years ago, but it just got the new Web 2.0 glossy 3D look to it with a darker blue color that makes it more serious and sincere. Really nice! Well done Jobs.ie!